My work is mostly about drawing, more specifically what I call marking and map-making. Even though I use a paint brush much of the time, and I use materials that are not just drawing materials, I feel my sensibility is one of drawing. My entire body of work has always been concerned with the concepts of development and evolution, activities which are both incredibly complex and filled with surprises. I enjoy working in a way that relates to how life evolves, and how nature works. The combination of a plan or code or formula, on the one hand, with accidents or unplanned activities, on the other, is a natural way of having an ebb and flow, something that keeps my work moving along. For me, the most interesting aspect of my way of working is that I never run out of ideas. I had a dream once when I was visiting in Venice: it showed me how to build a new kind of structure in my drawing. It was an early-morning dream, and when I awoke I grabbed a small watercolor block and a pencil and drew what I had dreamed – and that was only the beginning. That first one wasn’t a complete work, so while I was still in Venice I made seven more small drawings – only 7 x 5 inches – based on that dream, and then when I returned home I made some larger drawings and some small paintings on linen along the same line. The dream itself was very simple. In it I took a pencil and made one dash mark on a piece of paper, near the center. Then at a right angle, in a clockwise turn, I made two dashes, and then turning at a right angle again, three dashes, and then four, and so on. When I woke up and began to express the dream in the actual drawings, I found that eventually the line of dashes would reach the edge of the page. This would give me a specific number of marks that I could count to, and then the variations would begin, in terms of modifying the rule. I could bounce the line back into the field of the page at the same angle it had when it hit the edge, or I could shift the direction from clockwise to counterclockwise, or I could do a number of other things. The growth pattern was loosely based on a spiral, but the marks weren’t measured with a ruler – they were all freehand – so there were unpredictable variations. The building process never could be exact. But the rule – and the changes I made in the rule – would keep things going, and at some point a workable structure would be there. Then I could build within it and on it – adding layers or filling in – but always in some kind of relationship to the original design. This has led me to an entirely new – and very interesting – way of working. The sense of a new reality came directly from the dream. I knew immediately it was important to me – a real oh-wow! moment – and this is why I remembered the dream so vividly, and in such detail. It opened a path for me to think in a radically different manner about my art. Until then, so much of my work had been based on the grid, and on that “grid” way of imagining things. Now my work was able to leave the grid – although the grid still could be superimposed as needed – but the structure based on the dream created an environment that seemed to challenge all my notions of what I had considered a “balanced” composition. I think that’s the most important thing about this breakthrough – and about my continuing to make things based on the dream. This process has enabled me to look at the ideas of balance and harmony from a different direction, a different point of view. Andrea Way’s art works at the intersection of system and beauty. She works out precise concepts on paper in graceful ways. Her mature work began in 1980 with marks, letters, and numbers put on paper according to sets of rules devised by the artist. Over the years these spare, grid-based works developed into ever more complex and subtle creations, although the rules have remained. But always, the schemes have been only the beginning. Her mark by mark explorations lead to surprising visual results. Over the years Way’s art has taken on new colors, textures and structures inspired by emotional experiences and the natural world around her. When the California-born artist visits her home state, she finds inspiration among the sea life and water-borne debris of beaches near San Francisco. 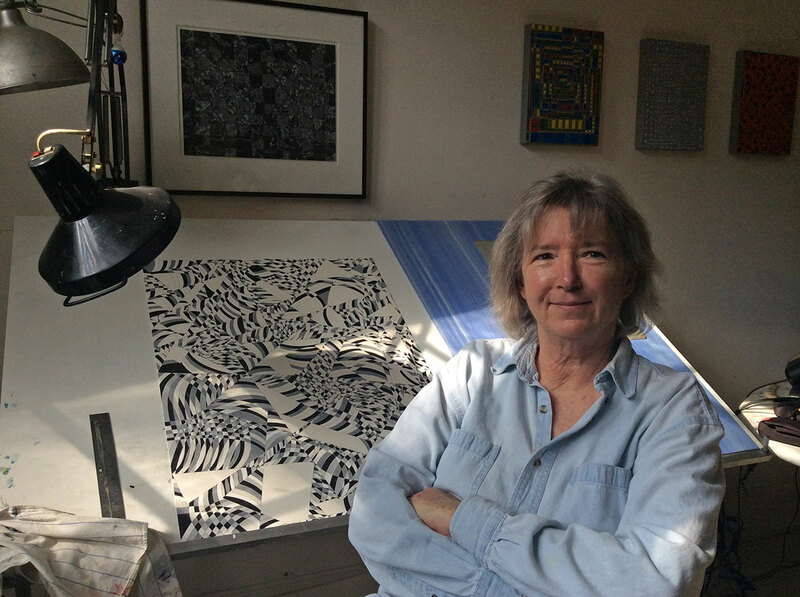 From her long-time home and studio in Washington, D.C., she often travels to Calvert Cliffs, a dramatic beach front on the Chesapeake Bay which is famous for its fossils. The natural forms of such finds have made their way into such images as the 1990 silkscreen Shark. While her studio is on a city street, the window by her drafting table looks out on hills covered with towering trees. Natural places and objects suggest shapes or colors or more subtle organizational concepts that inform her art. Way works with rational systems, based upon numerical sequences and similarly finite rules. And yet she is opened to whatever may happen as she draws. An unexpected interaction of lines and shapes, or a slip of the hand may suggest new creative directions. She builds up layers of drawn patterns as the earth lays down layers of soil with each passing season. Each layer interacts with those above and below, and with what happens as it is deposited. Way’s patterns grow and vary within a single work or a series of works much the way a tree grows. Each section of a drawing reflects the whole as a leaf or small twig reflects the structure of the whole tree. Her drawings reward both close viewing to see every touch of her hand in the crafting of details, and stepping back to grasp the sophisticated overall conception. For many years, Way’s work was largely based on the grid, which has long been at the heart of conceptual art and many other human constructions. But Way’s Venetian Dream series and related works are based upon a dream she had when visiting Venice in April 2009. There, among the historic stone buildings, mosaics gleaming with gold, and luminous sky and sea, the artist had an early morning vision. She saw herself creating a graphic spiral that let her art grow out from a center instead of being arranged in a rectangular grid. A whole new array of possibilities opened up. Way’s works in this exhibition include the original 5 by 7 inch drawings she made in Venice and on which all the rest of the drawings and paintings in this series are based. Over the last 5 years, the artist has continued to work with this new approach, finding fresh ideas with every turn of the spiral. Courtesy of Curator's Office, Washington, D.C. Courtesy of Curator’s Office, Washington, D.C.